Today at VMware Partner Exchange (PEX), HP announced vCenter Server integration for its HP OneView systems management package. Using REST API calls to HP OneView, the vCenter plugin is now able to initiate actions in HP OneView directly from the vSphere Web Client. HP OneView, introduced last September, is a central platform of the Converged Systems group and it is the glue that takes disparate components and makes them into a cohesive solution. The current version has support for HP BladeSystem, Virtual Connect and Gen8 ProLiant blades and rack-mount systems. Proliant G7 blades are also supported. It has a roadmap for adding support with HP networking and HP storage in the future. HP OneView provides both deployment, management and monitoring capabilities so that administrators can build out solutions and maintain solutions. As part of a demo of the integration, HP is showing off the ability to completely automate the build and deployment of ESXi nodes in a new cluster and into existing clusters. 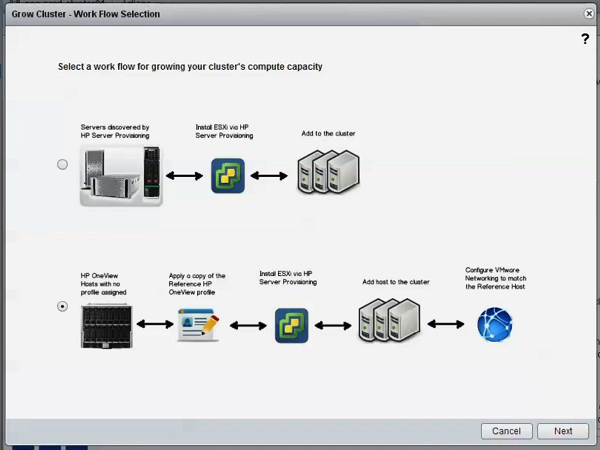 By utilizing OneView’s engine, a VMware administrator can kick off the orchestration of a new hardware build directly from vSphere Web Client using a simple “HP Grow Cluster” menu item (pictured above). The menu item kicks off a wizard drive workflow (at right) that calls the tasks in OneView via its REST API. The vCenter plugin allows the administrator to pick a reference server profile, create multiple server profiles from the template and then uses HP Server Provisioning to deploy an ESXi host build plan. At the core of OneView is the software-defined model of IT – where the underlying hardware is abstracted from the software-based configuration and settings. The reference server profiles define a base level of hardware and combined with settings, including firmware levels, BIOS settings and the ProLiant server model and generation preferences. Once the reference profile is deployed, it becomes a server profile assigned to physical hardware. Like Virtual Connect server profiles, these are portable and can be migrated between physical hardware. 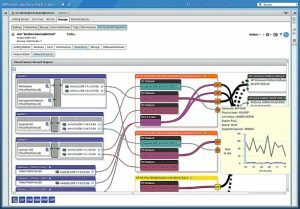 Customers who are familiar with HP’s Insight Control for vCenter will notice many similarities between the OneView integration and the Insight Control integration. 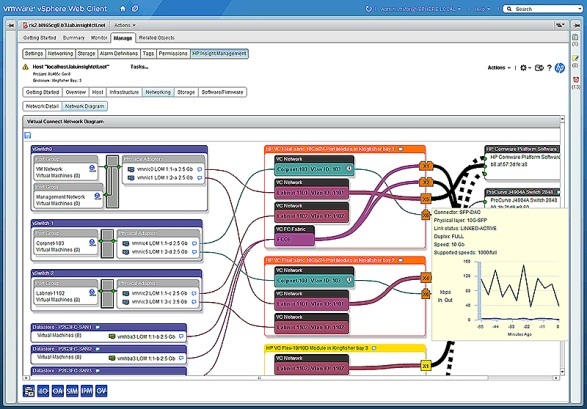 The OneView plugin for vCenter shows network diagrams of port mappings and configuration as well as end-to-end storage mapping from the VM to the LUN and storage array. The current iteration of OneView relies on the same Insight Control for vCenter storage plugin. OneView has yet to adopt storage control and management directly into its platform, though it seems safe to expect its coming given HP’s direction. The majority of this announcement is that VMware administrators can now kick off OneView tasks directly from the vSphere Web Client, monitor and view the progress and completion of the tasks it spawns. OneView is still in early in its life, but the interface is simple and intuitive. Its not overly complex at this time and its build with modern concepts, like search, deeply integrated into the core product. Extensions like the vCenter plugin are great enhancements for administrators who are accustomed to working in a native platform and gain access to the capabilities of OneView directly from a familiar console. This release continues on HP’s track record of delivering usable functionality directly to VMware administrators from vCenter. 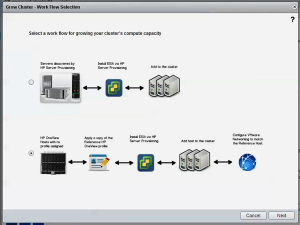 The HP team has a video demonstration of the HP Grow Cluster feature in the vCenter Web Client posted at hp.com. It is definitely worth a watch to see the entire process orchestrated with just a few clicks and settings. SafeCopy: My answer to the Mozy changes?